The annual Lord Mayor's show was held last Saturday. There has been a Mayor of the City of London since 1185 in times when the King had to be wary of his Earls and Barons and probably anyone else in a position of power, including the church, King John granted a charter in 1215 to the people of London allowing them to elect their own mayor each year. In return the Mayor, who later became known as the Lord Mayor was required to make the journey to the city of Westminster and swear allegiance to the sovereign. This journey continues every November. It's a very grand occasion and the Lord Mayor travels in a gold carriage to the courts to take his oath. The day before the parade I popped along to see how preparations were progressing. 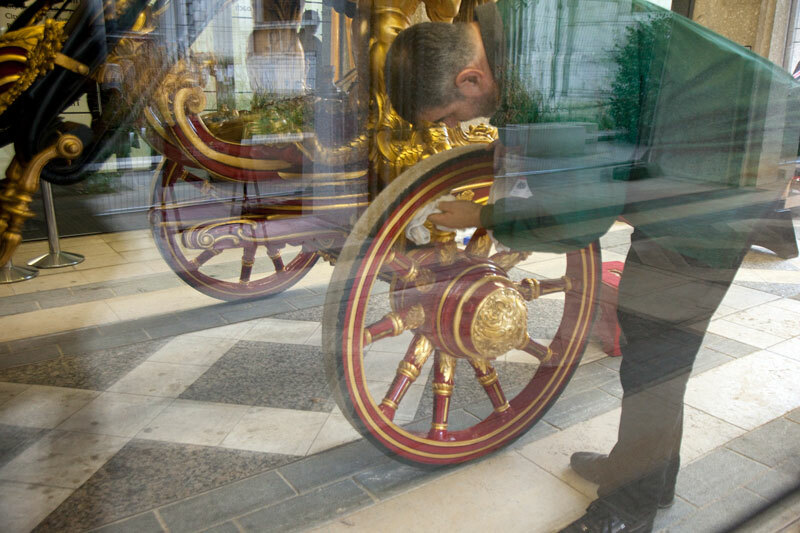 As you can see in the image above the gold carriage was being polished and groomed for the occasion. One thing we do better than anyone; ceremonial. on one of my trips to London, I visited the Royal Mews and was in awe of the beautiful and elaborate coaches there. They really are stunning. And a Bentley in the garage ? That carriage must require quite a lot of maintenance to keep it in shape! It brings the tourists in, and its good to keep these traditions alive.